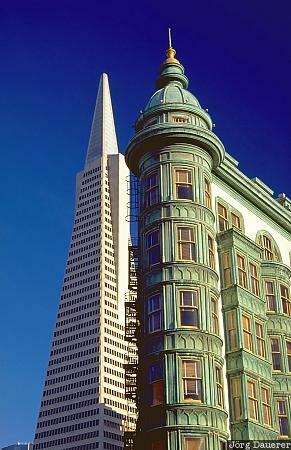 The Transamerica Pyramid, one of the landmarks of San Francisco in front of blue sky with the Sentinel Building in the foreground. San Francisco is in the Bay Area in northern California, United States. This Photo was taken in the afternoon of a sunny day in October of 2000.